Ignorance is bliss except in self-awareness. What you don't know about yourself can hurt you and your relationships and maybe even how you make your way in the world. It can also keep you in the shallows with God. Do you want help figuring out who you are and why you're stuck in the same ruts? The Enneagram is an ancient personality type system with an uncanny accuracy in describing how human beings are wired, both positively and negatively. InThe Road Back to You Ian Morgan Cron and Suzanne Stabile forge a unique approach a practical, comprehensive way of accessing Enneagram wisdom and exploring its connections with Christian spirituality for a deeper knowledge of God and of ourselves. Witty and filled with stories, this book allows you to understand more about each of the Enneagram types, keeping you turning the pages long after you have read the chapter about yourself. Beginning with changes you can start making today, the wisdom of the Enneagram can help you get on the road that will take you further along into who you really are leading you into places of spiritual discovery you would never have found on your own, and paving the way to the wiser, more compassionate person you want to become." Ignorance is bliss--except in self-awareness.What you don't know about yourself can hurt you and your relationships--and maybe even how you make your way in the world. It can also keep you in the shallows with God. Do you want help figuring out who you are and why you're stuck in the same ruts? The Enneagram is an ancient personality type system with an uncanny accuracy in describing how human beings are wired, both positively and negatively. In The Road Back to You Ian Morgan Cron and Suzanne Stabile forge a unique approach--a practical, comprehensive way of accessing Enneagram wisdom and exploring its connections with Christian spirituality for a deeper knowledge of God and of ourselves. Witty and filled with stories, this book allows you to understand more about each of the Enneagram types, keeping you turning the pages long after you have read the chapter about yourself. Beginning with changes you can start making today, the wisdom of the Enneagram can help you get on the road that will take you further along into who you really are--leading you into places of spiritual discovery you would never have found on your own, and paving the way to the wiser, more compassionate person you want to become. "Cron and Stabile walk through the Enneagram's nine different personality types and their distinct ways of seeing the world, showing how each one has a potentially infinite number of expressions, strengths, and weaknesses. Cron describes his own Enneagram experience as a feeling of waking up after having been asleep for a long time. He explains that in catching a glimpse of the person he was created to be, he began to see himself with the same delight, pride, and expectation with which God sees him, and to sense the immediacy of God's grace. 'In the spiritual life that's no small thing,' he writes." "Cron brings his witty, energetic voice to this collaboration with Stabile, a retreat director and expert on the Enneagram--a system of personality typology with roots in Christian and Islamic mysticism. The beauty of the Enneagram is its charity: the system clearly names the flaws as well as the virtues of each personality type. The Enneagram also counsels humility and acknowledges its own limits ('[The Enneagram] is not infallible or inerrant,' writes Cron and Stabile)--a welcome modesty in religious understanding today." A++++ eBay seller. Will buy from here again. excellent eBayer, A+++, thanks so much!!! Great condition, exactly as described. Fast shipment too! Item as described! Smooth transaction! Thank you! Smooth and easy transaction, fast shipping. Item as described. Tried to contact seller through the link provided - would not go through. This book gives you great insight about yourself and why you think, communicate, and act the way you do. It’s an excellent easy read and it’s even humorous at times. It will also challenge you to be the best you can be! This is a great book! Learning the enneagram gives you more insight into yourself and people around you. Very helpful and interesting. The writer is funny also. Wasn’t sure if I would find the content applicable or sane, but in the end good introspective and worth the read and contemplation. 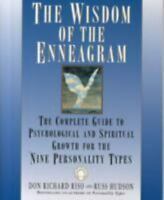 A classic book on the enneagram. I haven’t read it yet, but it comes highly recommended. Really reveals why each of us thinks and behaves the way we do.